We love our neighborhood. A 20-30 minute subway ride into Manhattan makes it the quintessential Brooklyn neighborhood. 4 blocks from the subway. The rich fabric of cultures and diversity makes our neighborhood friendly and welcoming. 3 REAL BEDROOMS, 2 BATHROOMS (1 full, 1 half), YOUR OWN KITCH/DR/LR. NOTE: Our bnb is legal in NYC, even under the new law. First, we are only a 2 family house (our family and yours). Secondly, we (the host) live in the house and are always there. A place of serenity in Brooklyn. 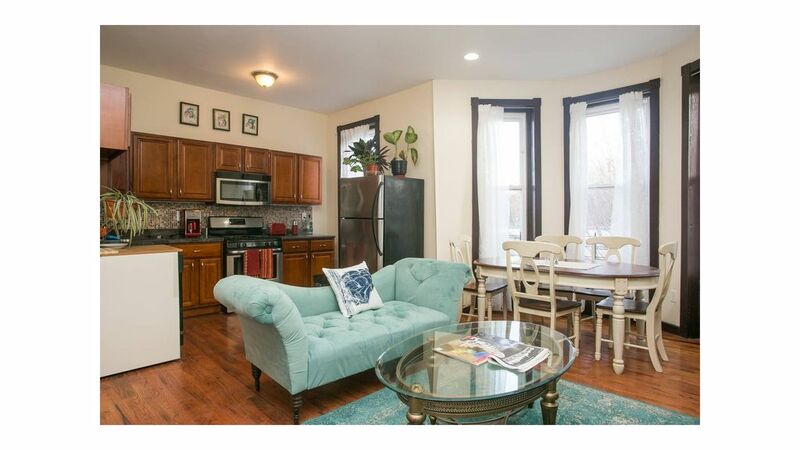 The space is a completely re-modeled, clean, sunny, 3 bedroom apt. You'll have the entire 2nd (top) floor. A residential street, quiet for NYC, yet only steps away from the subway to Manhattan. Gorgeous sweet house with details from 1902. All wood floors. Brand new furniture, beds, bedding, sheets, and towels. High-speed internet, premium cable and wifi are included. The new kitchen/living room has a dining table in the bay windows alcove, new chairs, new couch, creature comforts galore. Dine with a view of a lovely quintessential Brooklyn City experience. You will find yourself living in a Local Artists Art Gallery, comprised of every room in The House. You'll find the refrigerator stocked with a six-pack of Local Craft Beer. Enjoy! Our favorite is the Coney Island Mermaid beer -- or maybe it's the Brooklyn Brewery Lager... You decide. The three bedrooms include a Romantic French Doored Bedroom in the center of the apartment and two extra-quiet bedrooms in the back. Each room is tastefully decorated with warm, relaxing colors to make you feel right at home. Two of the Bedrooms have Queen Size Beds and one is equipped with a Full (Standard/Double) Size Bed. Serene view of backyard garden from the two rear bedrooms. Lovely mantels and artwork. Each of the 3 bedrooms has its own private roomy closet and writing/computer desk. The apartment has wooden floors and rugs throughout. See photo's. Fresh linens, blankets, and towels are provided. Kitchen is fully equipped with everything you need for a comfortable stay: microwave, dishwasher, coffee maker, gas stove/oven, refrigerator, cookware, flatware and dishes. Free coffee, tea, and fresh running filtered water, for your convenience. Private clean modern tiled bathrooms with full size bathtub and shower. Soaps, shampoo, conditioner, and towels are provided. Hair Dryer, Clothes Iron, ironing board, folding luggage racks, roomy closets, and Full length mirrors. Space is professionally cleaned before your arrival. If you would like additional housekeeping services during your stay, we can make arrangements for you, for an additional fee, payable directly to the housekeeper. Enjoy our brand new clean, beautifully decorated, and comfortable apartment with all utilities, high-speed internet, cable tv and (website hidden) has virtually all premium channels including HBO, movies, sports, etc. Our 50" TV is also WIFI connected and has apps for Netflix, YouTube, Web Browser; and can mirror your phone or tablet. Massage (licensed), yoga coach and reflexologist available on site by appointment. Owner and family (all in the arts) live in The House, with our own bathrooms, living spaces, etc. in separate living spaces. (There are no tenants or bnb guests besides you.) Your guest apartment with three bedrooms consists of one floor with a semi-private entrance, beautiful separate kitchen, living room, 1.5 bathrooms, dining area, 50" HD TV with Wifi Smart Apps on the TV; e.g. for Pandora, Netflix, YouTube, Web Browser, etc. You will have access, weather permitting, to the small front courtyard garden. Booking is done through Airbnb web system. All payments are handled by Airbnb. There is a $200 replacement fee for lost keys. This bnb is completely legal and is registered with NYC. We, your hosts, agree to pay for all local occupancy taxes. Our Certificate of Authority with the New York City Department of Finance, ID No 42945. Everyone in our 'hood is friendly and says hello in this ethnically diverse community. We are on a quiet residential block, a refuge. Brooklyn is so interesting w/ cafes, galleries and restaurants from Mexican to Jamaican to Thai. There are many different restaurants in the neighborhood that deliver to the house. The immediate neighborhood is up and coming, with new cafes opening up and being built as we type this up! Subways: Walk 3-4 blocks to catch the L train (a 5 min walk). The L takes 20 minutes to the East Village, 25 minutes to Union Square, about 30 minutes on the train to Times Square (after 1 transfer + 1 stop). Even closer to the J/Z train which takes you to the financial district in 15 minutes. The A/C train is also right nearby. From the airport you can take a car service or taxi cab. Only 20-25 minutes from JFK or LGA. Cabs are everywhere in Manhattan and take all credit cards. We can also hook you up with a reasonable 24 hour Bushwick car service to get you swiftly to and from The House anytime you want a direct pick-up or drop-off. Alternatively, the Smartphone Apps, Uber and Lyft, seem to work well in this area. No Smoking inside, No Parties, No Pets. PLEASE BE SURE WE HAVE YOUR ARRIVAL TIME (or Airport Name and Flight arrival time) AT LEAST ONE WEEK IN ADVANCE. Please be considerate of our home and clean up after yourselves. Trash and Recycling go in the provided receptacles only, never on the sidewalk or street — and please organize per NYC law (details posted inside) — i.e., put recyclables in separate trash bins, as defined. Nothing inappropriate in toilets or sink drains; e.g., no paper towels, no wipes, no hair, no food, no feminine hygiene products, etc. Keep water off the floors — e.g., use the bath mats; keep shower curtain inside tub when taking shower, etc. Promptly clean up any spills. We won't bother you; but in case of any building emergency, guest agrees to check either text messages or email at least every day or two during the trip. If you need or want anything during your stay, please don't hesitate to let us know by sending a message via the airbnb messaging system. Should you notice anything in need of repair or maintenance, please inform us immediately via the airbnb messaging system. If you would prefer that we make any repairs after you leave, it's okay to say so — and assuming that waiting won't cause any harm, we will certainly honor your wishes. But it helps us to plan for repairs to be made if we are promptly informed please. old fashioned radiator system - works well! This Cypress Hills location was just as described and much more. Clean, warm, comfortable and safe. Walking distance to anything you may need and all were friendly and helpful. Came with all the amenities that you would need, even umbrellas for your use. The beds were very comfortable, and the rooms were heated upon arrival. Our hosts Shosh and family were very accessible and helpful. We would defiantly stay here again and highly recommend staying here. We loved the house and neighborhood! Our hostess, Shosh was very friendly and helpful. We really liked the house and neighborhood. Convenient to subway station and had some good small restaurants and delis/grocery stores. Our hostess was great! Trevlig lägenhet med bra kök. När till tunnelbana och mataffär. Lägenheten är charmig med en lite annorlunda planlösning. Köket är väl utrustat och det är lätt att lagatill frukost för familjen. Vi trivdes väldigt bra och värdinan var trevlig. Gepflegte Wohnung In Brooklyn ideal für 4 Personen. Die Wohnung liegt verkehrsgünstig und Fußläufig zu erreichen in der Nähe von verschiedenen U-Bahnstationen und Linien. Bis Manhattan sind es ca. 30 min mit der U-Bahn. Insgesamt ist die Wohnung eine gute und preisgünstige Alternative zu den Hotels in Manhattan.